Do YOU know who GLOBE is? If you're into Japanese Music, surely the name is familiar. 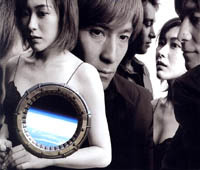 GLOBE has risen in the Japanese Music charts constantly since their debut in 1995. With the leadership of J-Music mastermind Tetsuya Komuro, there's no telling how big this group can truly get. Tetsuya Komuro is a widely known name to those in the Japanese Music business. Producer of a countless number of J-pop Idols and Groups, it is not surprising that his own group is as successful as they are today. His newest group however, "Kiss Destination", seems to be gathering the same amount of fans that GLOBE once did at the same time of their release - - "Kiss Destination" features TK and Asami Yoshida, and perhaps they have a chance of even over-riding GLOBE. Speaking of TK's highly successful occupation, his new record label with Sony Music Japan is entitled, "True Kiss Disc", with branches in both Japan and Hawaii. Back to the topic at hand. This double disc set features top tracks on two CDs; the first disc containing hits from 1995-1999, the second disc containing new releases of 2000. If you're familiar with TK's style, you'll know that he always has strange, abstract "prologues"/"interludes" on albums. This is one of them.. Its quite funny though. Its some form of a prank call overseas. Good beat, nice mix. I personally have not heard the original/regular mix, but I'm sure its just as good in its own way. Not one of my favorites, but the song has some potential. Nevertheless, its one of the early hits. Keiko's voice wasn't strong at this point quite yet. I love the beat in this song, and it has a seductive twist; You can blame that part on Keiko! ^^; I like the short interlude in the beginning between TK and Keiko.. Why? NO idea... "I'm worried about her... but I can't help you." This song has one of the best rap sessions Globe has ever had. Of course, this is between TK and Keiko once again, and the beat accompaniment is awesome. Keiko's voice strength definitely increased by this time compared to the first track. TK's talent of beat and tempo is simply overwhelming. This song is one of my favorites. Odd how I don't know what quite to say about it though... must be breathtaking! Hehe. Marc's rap in the middle of the song is a little funny though, because he does it in such a rugged manner. If you're a fan of Every Little Thing, this song is surely to catch your eye.. or, ear, rather. The first thirty seconds of the song is very familiar to ELT's 1998 hit, "Time Goes By". I love both songs, but I sway more to ELT's hit than this. Another of my most favorites. The tempo and mixing in this song just kicks. Again, Keiko and the background singers blend so well with the effects of the song, and I can't tire of it! I can't quite put my finger on it, but this song sounds so very familiar to another J-Pop hit I've heard before.. Yet another track where Marc gets to shine, nonetheless. I like the guitars and synthetic beats used here. TK's piano is beautiful, as usual. The piano and bass-like beat compliment eachother quite well, surprisingly. TK's mysterious-like voice adds flavor to this track, as Keiko brings it to life. This song almost sounds like a track from Kiss Destination's "Gravity" Album, but the exact track escapes me at the moment. I love this song too, as it is one of Globe's mid-tempo ballads. My favorite part is the chorus, not to mention TK's rap interludes. The ONLY style of this nature that I have heard of Globe... It resembles the old 50's style of music! Its great, nonetheless... but I always get the notion of wanting to see Globe performing in poodle skirts and high school sweaters when I hear this song... Hehe. Consisting first of a short prologue, this song has great potential as well. Its more of a light-rock song with a touch of rap. Great song! Another "prologue"/"interlude" number. A bit of a bass-beat mix with voicing. Now this is a good song. The music input as well as vocal is truly getting better by the year with this group. Everyone gets a chance to shine in this song, and the echo effects make the song into a lovely ballad with great beat. Its quite odd being able to hear so much of Globe's style in a short matter of hours. Its great for comparison reviews, such as this one I'm conducting now. Globe's style has differed a bit from before, as we can hear from this song - - Yes, it includes the natural beats TK has in his songs, but it just has this nice R&B mood to it. I really love Keiko's voice now.. Its smooth and effective. Ahh! Truly my favorite of any tracks on this compilation set... TK's "Piano Solo". This man is truly a genius if he can compose music so simply yet so beautiful! Sugoi! Now this is a song that reverts back to a little of Globe's mid-term style [i.e Anytime smokin' cigarette]. I am very pleased with their somewhat 'revised' form of style though. All of the newer songs, like this, have such a great mixture, that you'll never really tire of them so easilly. This song is awesome, particularly in the midst.. It goes from a soft cry to a loud bashing message! Marc shines again. What can I say about this song that would differ from the other great reviews? Beat, mix, etc. Although, its great to hear Keiko rap.. They should do that more often! This is another track that sounds remotely like something of Kiss Destination's, yet with a Namie Amuro twist. I like this as well. It sways more as a ballad-beat song, but great nonetheless. I love Marc, but like the track before this, it annoys me! It sounds as if they are repeating the same phrase repeatedly, but it's a moderately "okay" song. Marc has some help rapping from TK here. Now, this song definitely has familiararity with Namie Amuro fans. A bit of a 'mix' version of NA's "You Are the One" from her "Genius 2000" album. Gee, I wonder.. Could this track have been on both albums because of TK? I personally prefer NA's version, though. Its too hip-hop in Globe's version. Another pop-ballad. Not too bad, but quite good, really. Not much to say of it though. Ahh. Alas we venture to the final track. Like track 4 of this very same disc, it is a piano piece performed by TK himself. This time, the theme is the tune of "Faces Places". Gorgeous like all of TK's other piano pieces, of course. What a way to end a double disc set! Ahh well...That was a mouthful to review. I really enjoyed this disc set, and I feel the need to refer it to anyone that is interested in getting into Globe for the first time, or even those who are long time fans. Overall, this double disc set deserves an astounding "A" grade! Oh yes, and my friend that works for TK... His name is Troy 'Yen' Gonzalez, and he is a recording engineer at TKD Honolulu, Hawaii. Give the man some applause! ^^ That's all for Dai-chan this review.. See you next month!